Dante is probably to Italian literature what Shakespeare is to British literature. Both are, because of the depth and density of their respective works, monuments of European literature who transcend national boundaries. As T.S. Eliot put it in 1929: “Dante and Shakespeare divide the modern world between them; there is no third.” This claim may be questioned, of course, but both authors did bring literature and the spirit of their time to a peak. It may be wondered whether Dante’s writings influenced Shakespeare and his contemporaries. However, this conference particularly aims at bringing together, beyond chronological considerations, the reflection and the aesthetics at work in their respective creations, by comparing them from thematic perspectives. — A Dante/Shakespeare “function” in contemporary imagination? An, Sonjae, “Echoes of Boethius and Dante in Chaucer’s ‘Troilus and Griselda’”, Medieval and Early Modern English Studies, vol. 12 , déc 2004, p. 393-418. Neuse, Richard, Chaucer’s Dante. Allegory and Epic Theater in the Canterbury Tales, Berkeley/Los Angeles/Oxford, University of California Press, 1991. Brown, Calvin S., “Dante, Shakespeare, and the Common Heritage”, Review (Blacksburg, VA), 1980, 2, p. 361-364. Bruneau, Jean, “La Figure de Jules César de Dante à Shakespeare”, Études Anglaises, 1964, 17, p. 591-604. Chesta Ugo, “Guido da Montefeltro e Amleto : ‘vite parallele’ “, Levia Gravia, X, 2008, p. 1-23. COPE, Jackson I, “Theater of the dream: Dante’s ‘ Commedia’, Jonson’s Satirist, and Shakespeare’s Sage”, in The Theater and the Dream, Baltimore, Johns Hopkins University Press, 1973, p. 211-244. Ferguson, Francis, “Romantic love in Dante and Shakespeare”, The Sewanee Review, LXXXIII, 1975, p. 253-266. Fergusson, Francis, “Trope and Allegory : Some Themes Common to Dante and Shakespeare”, Dante Studies with the Annual Report of the Dante Society (Binghamton, NY), 1968, 86, p. 113-126. Herzman, Ronald B., “Fraternal (Un)Masking : Shakespeare’s ‘Measure for Measure’ and Dante’s ‘Inferno’ 27″ in Franco R. Bradley, Beth A. Mulvaney (eds. ), The World of St. Francis of Assisi. Essays in honor of William R. Cook, Leiden-Boston, Brill, 2015, p. 121-139. Goldstein, Gary B., “Did Shakespeare Read Dante in Italian ?”, The Elizabethan Review (ERev), 1993 Spring, 1 (1), p. 61-62. Kirkpatrick, R., “On the Treatment of Tragic Themes in Dante and Shakespeare”, Modern Language Review (Edinburgh, Scoltland), 1977, 72, p. 575-584. Lawson, Jacqueline E., “The Infernal Macbeth”, Aligarth Critical Miscellany (ACM), 1988, 1 (1), p. 33-43. Maillet, Gregory, “‘Fidelity to the Word’ : Lonerganian Conversation through Shakespeare’s The Winter’s Tale and Dante’s Purgatorio”, Religion and the Arts (ReAr), 2006 ; 10 (2), p. 219-243. Malamud, Randy, “Shakespeare/Dante and Water/Music in The Waste Land”, in Jewel Spears Brooker (ed. and introd. ), T. S. Eliot and Our Turning World, London, Macmillan/St Martin’s, with Institute of Unites States Studies, University of London, 2001, p. 1000-113. McFall, E. K., “Macbeth and Dante’s Inferno”, Notes and Queries, 2006 Dec, 53 (251) (4), p. 490-494. Mortimer, Anthony, “Shakespeare and Italian Poetry”, in Jonathan Post (ed. ), The Oxford Handbook of Shakespeare’s Poetry, Oxford, OUP, 2013, p. 116-133. Obertello, Alfredo, “Dante e Shakespeare”, in Vincenzo Pernicone (ed. ), Miscellanea di studi danteschi, Genoa, Lib. Ed. Mario Bozzi, 1966, p. 93-102. Picone, Michelangelo, “Onomastica e tradizione letteraria : il caso di ‘ Romeo e Giulietta’”, Il nome del testo. Rivista internazionale di Onomastica Letteraria, 1, 1999, Pisa, p. 87-99. Quinones, Ricardo Joseph, “Time in Dante and Shakespeare”, Symposium : A Quarterly Journal in Modern Foreign Literatures (Syracuse, NY), 1968, 22, p. 261-284. Satin, Joseph, “Macbeth and the Inferno of Dante”, Forum (Houston, TX), 1971, 9 (1), p. 18-23. Smith, Albert-James, The metaphysics of love. Studies in Renaissance love poetry from Dante to Milton, Cambridge, CUP, 1985. Tambling, Jeremy, “Monstrous tyranny, men of blood : Dante and ‘Inferno’ XII”, The Modern Language Review, XCVIII, 2003, 4, p. 881-897. Whallon, William, Inconsistencies : Studies in the New Testament, the Inferno, Othello, and Beowulf, Cambridge, Biblio, 1983. Webster, Richard, “Dante e Shakespeare”, Cultura nel mondo, 1973, 27 (5-6), p. 12-20. Webster, Richard, “Two Hells : Comparison and Contrast between Dante and Shakespeare with Particular Reference to Inferno, X and Richard III I, iv”, Nottingham Medieval Studies (Nottingham, England), 1975, 19, p. 35-47. Williams, Rae, “The Ghost of Dante Alighieri in Shakespeare’s Romeo and Juliet”, in Kiki Gounaridou (ed. and preface), Text & Presentation : The Comparative Drama Conference Series, 8, McFarland, 2012, p. 34-40. Freccero, John, In Dante’s Wake : Reading from Medieval to Modern in the Augustinian Tradition, New York, Fordham UP, 2015. Frontain, Raymond-J., “Moses, Dante, and the Visio Dei of Donne’s ‘Going to Bed’”, A Quarterly Journal of Short Articles, Notes, and Reviews, 1993 Jan, 6 (1), p. 13-17. Fleissner, Robert F., “Donne and Dante : The Compass Figure Reinterpreted”, Modern Language Notes, 1961 par, 76 (4), p. 315-320. Creasy, William C., “The Shifting Landscape of Hell”, Comitatus : A Journal of Medieval and Renaissance Studies, 1980, 11, p. 40-65. Heninger, S. K., Jr, “Sequences, systems, Models : Sidney and the Secularization of Sonnets”, in Neil Fraistat (ed. ), Poems in Their Place : The Intertextuality and Order of Peotic Collections, Chapel Hill, U of North Carolina P, 1986, p. 66-94. Benson, Robert G., “Elizabeth as Beatrice : A Reading of Spenser’s Amoretti”, South Central Bulletin, 1972, 32 (4), p. 184-188. Morgan, The Shaping of English Poetry, Volume III/ Essays on Beowulf, Dante, Sir Gawain and the Green Knight, Langland, Chaucer and Spenser, Bern, Peter Lang, 2013. Paolina, M., “Spenser and Dante”, English Miscellany : A Symposium of History, Literature and the Arts, 1963, 14, p. 27-44. Paolucci, Anne, The Women in Dante’s Divine Comedy and Spenser’s Faerie Queene, Dover (DE), Griffon, for Bagehot Council, 2005. Parker, Pauline, “The Image of Direction in Dante, Spenser and Milton”, English Miscellany/ A Symposium of History, Literature and the Arts (Rome, Italy), 1968, 19, p. 9-23. Tosello, Matthew, “Spenser’s Silence about Dante”, Studies in English Literarture, 1500-1900, 1977 Winter, 17 (1), p. 59-66. Haveley, Nicholas, Dante’s British Public: Readers and Texts from the Fourteenth century to the Present, Oxford, OUP, 2014. Marrapodi, Michele, Shakespeare and Intertextuality : the Transition of Cultures between Italy and England in the early Modern Period, Roma, Bulzoni, 2000. Marrapodi, Michele (ed), Italian Culture in the Drama of Shakespeare and his contemporaries. Rewriting, Remaking, Refashioning, Farnham, Ashgate Publishing Limited, coll. “Anglo-Italian Renaissance Studies”, 2016. Marrapodi, Michele, Shakespeare and the Italian Renaisance. Appropriation, Transformation, Opposition, Farnham, Ashgate Publishing Limited, coll. “Anglo-Italian Renaissance Studies”, 2014. Redmond, Michael J., Shakespeare, Politics, and Italy. Intertextuality on the Jacobean Stage, Farnham, Ashgate Publishing Limited, coll. “Anglo-Italian Renaissance Studies”, 2009. Tomita, Soko, A Bibliographical Catalogue of Italian Books printed in England, 1558-1603, Farnham, Ashgate Publishing Limited, coll. “Anglo-Italian Renaissance Studies”, 2009. Tomita, Soko, Tomita, Masahito, A Bibliographical Catalogue of Italian Books printed in England, 1603-1642, Farnham, Ashgate Publishing Limited, coll. “Anglo-Italian Renaissance Studies”, 2014. Gervais, David, “Eliot’s Shakespeare and Eliot’s Dante”, in Jewel Spears Brooker (ed. and introd. ), T. S. Eliot and Our Turning World, London, Macmillan/St Martin’s, with Institute of Unites States Studies, University of London, 2001, p. 114-124. Haveley, Nicholas, Dante’ s Modern Afterlife : Reception and Response from Blake to Heaney, Basingstoke, Palgrave MacMillan, 1998. Haveley, Nicholas (ed), Dante in the Nineteenth Century : Reception, Canonicity, Popularization, Pieterlen (Switzerland), Verlag Peter Lang, 2011. Lummus, David, “Dante’s ‘Inferno’. Critical reception and influence”, in Patrick Hunt (ed), Critical Insights. The Inferno, Pasadena, Salem Press, 2011, p. 63-81. Uricchio, William, “Dante’s Inferno and Caesar’s Ghost : Intertextuality and Conditions of Receptions in Early American Cinema”, in Richard Abel (ed. ), Silen Film, New Brunswick (NJ), Rutgers UP, 1996, p. 217-233. D.H.Lawrence has often been viewed as a post-romantic nature writer. Instead of looking back towards the 19th century writers who influenced him, we propose to consider how his literary practice and the philosophy that underlies it herald the ecocritical turn of the late 20th century. Broadly speaking, ecocriticism focuses on the study of the relationship of man with his natural environment from an interdisciplinary point view. It is concerned both with the protection of the environment and the destiny of man in the geological era called the Anthropocene. Ecocriticism is a broad term, pointing to innumerable trends: ecopoetry, ecophilosophy (see Guattari’s ecosophy), ecoethics, ecoethology, ecopolitics, ecofeminism etc. We know that Lawrence very early in his life became aware of the damage caused to the world we live in by man’s activities. We would like to analyse what the concept of nature means for him and how the attention he pays to the non-human and to the material world affects his art and connects both with his personal ethics and his form of spirituality. We will study the extent and the limits of Lawrence’s “green thinking” in all areas, including his reflection on the man/animal dialectics, on what it means to be a man, his vision of man and woman in society, his criticism of waste and of our materialist society, his meditation on “the silent great cosmos” and his special brand of ecosexuality. Keynote speakers: Fred Burwick (UCLA), Mary Jacobus (Univeristy of Cambridge), and Juliette Wells (Goucher College). Organisers: Institute of English Studies, Jagiellonian University in Kraków; Polish Society for the Study of European Romanticism. ‘Great spirits now on earth are sojourning’, wrote Keats in 1816. While his sonnet celebrates the originality of his contemporaries and the historical significance of his times, it also points to deep interest in ‘the hum of mighty works’ in all the fields of human activity – to which “the nations” ought to listen. In her book Romantic Interactions, Susan Wolfson defines ‘interaction’ as the way in which writers define themselves as ‘authors’ in relation to other authors. Although Romantic writers tend to assert their individuality, this assertion often takes the form of positioning themselves in connection to other authors and literary texts. Keats’s poem suggests not only interactions between poets, artists and social thinkers in the same language, but also the idea of international appreciation and interaction. Our conference builds on Wolfson’s idea by broadening the subject to explore the interactions of Romantic authors within the wider scope of European and American culture. We are interested in exploring Romantic writers’ interactions with their contemporaries, the culture of the past, and their interactions across the arts and sciences. Proposals for 20-minute individual papers (250 – 300 words) by 7 January 2019. Applicants should include a brief biographical note of up to 150 words. Submissions should be sent to romantic.interactions@gmail.com. Notifications of acceptance will be sent out by 15 January 2019. We also invite submissions to panel sessions “RÊVE Romantic Europe: The Virtual Exhibition” and “German Romanticism and its (Cultural) Interactions with Past, Present and Future”: see the following call for papers. The conference is organized in Krakow, a UNESCO city of literature, which truly celebrates ‘the great spirits’ of the Romantic Age with the statue of Adam Mickiewicz in the centre of the medieval Market Place and the mound built in honour of Tadeusz Kościuszko on the outskirts of the city. With its historic monuments, vibrant cafés and lively academic and literary communities, Kraków attracts visitors from all over the world, and was recently home to Nobel Prize winning poets Czesław Miłosz and Wisława Szymborska. Romantic Interactions, Krakow, 4-6 April 2019. Addressing both an academic and a general audience, RÊVE is an interdisciplinary online project showcasing and sharing Romantic texts, objects, and places through a panEuropean collaboration between academic researchers, museums, galleries and other cultural groupings. It aims to examine and compare the ways European Romanticisms constructed foundational ideas of cultural consumption, authorship, and medium. To do this, it explores and describes how these ideas were expressed and experienced through iconic objects (conceived in the broadest sense as comprising buildings, landscapes, and artefacts). RÊVE is designed to organise, curate, and make publicly accessible up to 100 microbiographies of the most compelling of these objects. Taking the interim form of a monthly blog-post, RÊVE launched in 2017 with ‘exhibits’ including Teresa Guccioli’s lock of Byron’s hair, Rousseau’s trapdoor, and a previously unknown oil-painting referred to in Madame de Staël’s Corinne. For further examples see http://www.euromanticism.org/ Prospective participants are invited to propose their cutting-edge research in the form of an ‘exhibit’ for RÊVE. Participants will be asked in the workshop itself to speak to a single image of their chosen object in a presentation of no more than 1000 words + a very short title. The organisers are particularly keen to expand the existing collection with exhibits from Poland and the countries of Eastern Europe. They also warmly welcome auditors interested in learning more about the project and the possibilities that it presents. Submissions: Paper proposals of ca 250 words should be submitted to the session convener and romanticinteractions@gmail.com by 7 January 2019. Applicants should include a brief biographical note of up to 150 words. Submissions: Paper proposals of 250 -300 words should be submitted to romanticinteractions@gmail.com by 7 January 2019. Applicants should include a brief biographical note of up to 150 words. For moe information on the Conference, see above. Keynote speakers: Jonathan Culler (Cornell University), Annabelle Dufourcq (RU Nijmegen), Nkiru Nzegwu (SUNY Binghamton), Susanna Paasonen (University of Turku). We welcome proposals for academic and artistic contributions that speak to the concerns of the workshop as outlined above. Abstracts (max. 300 words) and a short biographical note (max. 100 words) should be submitted to realitiesfantasies2019@gmail.com before 15 November 2018 (new extended dealine). Submissions will be responded to before 1st December. Written versions of all papers will be circulated to all participants before the workshop. All accepted speakers are required to submit a 3000-word paper before 1st March 2019 (new extended deadline), so every participant gets the chance to have a look at the other papers in their panel. We kindly ask prospective participants to bear this in mind before submitting an abstract. Thanks to the generous support by the Amsterdam School for Cultural Analysis and the Netherlands Institute for Cultural Analysis, participation is free and lunches will be provided. All questions about the workshop can be directed at the email address mentioned above. More information will soon be announced on: http://realitiesfantasies.wordpress.com. Proposals for 20 minutes papers in the form of a brief abstract (200-250words) and a short biographic note should be emailed as pdf/word files to essay.malta2019@um.edu.mt or through the conference page on https://www.um.edu.mt/events/essay2019/about by 21 May 2018. Any queries about the conference should be sent to the same email address. Please send your proposals to both Andrew Hodgson (andrew.hodgson@u-pem.fr) and Marie-Françoise Alamichel (marie-francoise.alamichel@u-pem.fr) in French or in English. 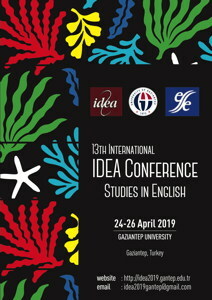 IDEA, established in 2005 by the Turkish national association for English studies as a member of ESSE (The European Society for the Study of English), is the largest and most comprehensive venue for the free exchange and dissemination of ideas on literary, language, and cultural studies in Turkey. IDEA aims at bringing together academics working in the fields of linguistics, literature, language teaching and cultural studies It is held at a different university in Turkey each year, and attended by scholars from around the world as well as around the country. IDEA 2019 is being hosted by the Department of English Language and Literature, at Gaziantep University. Only email submissions will to be accepted. Please include your name, affiliation, abstract title, email address, a brief biography and 5-6 keywords pertaining to your topic. We would also appreciate if you could write the name of the field of study in the title section of your email. After sending your abstract you should receive a confirmation email within 3 workdays. If you have not received a confirmation after 3 work days, please contact us. All the abstracts will be peer reviewed. Due to increased interest for final paper submissions deadline extension for the 13th International IDEA Conference: Studies in English, which will be held in Gaziantep between April 24-26, 2019, the organizing committee has decided to extend it until December 21, 2018.We are looking forward to seeing you in Gaziantep! INFORMATION: Detailed information on registration, conference fees, accommodation, etc. will be provided on the IDEA 2019 conference website http://idea2019.gantep.edu.tr beginning in September 2018, and regularly updated.